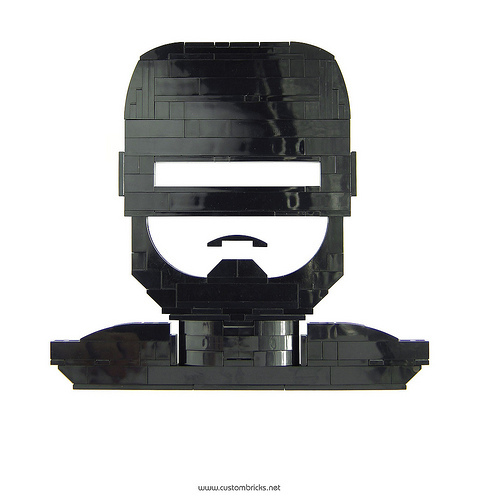 Kristi McWii (customBRICKS) returns to the Brothership with a study in minimalism featuring everyone’s favorite cyborg law enforcer from the 1987 film RoboCop. I know some of you don’t like free-floating parts in your models but I’m confident you can look past it and appreciate this immediately recognizable silhouette. Thank you for your cooperation. ‘Floating’ visually or physically? Looks to be attached with a *x2 Brick of sorts. Either way, pretty neat. That’s what I get for blogging from my phone, you’re quite right, there is a white brick in there holding his mouth in place. It is indeed pretty neat and he’s got a nice version of the Batman and Mickey Mouse too.